You can hardly see my bump. I found out 2 weeks ago I was having twins when I went to the E.R. from bleeding. The Doctor saw 2 heart beats! Twins do not run in the family at all! I'm starting to worry though becuase I just looked bloated. I hope I will start showing soon. Congrats to you! 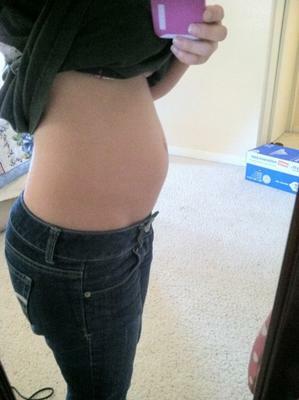 I am 12 weeks 4 days today and my belly looks just like yours but I dont think I have twins lol. Good luck with 2 of them, I hope they are your first that way you dont know how easy it would have been with just one lol. I'm 13wks 6days. My belly is a lot bigger than your cute little one! Mine are fraternal and the one is also hiding behind the other. Makes it really hard to get the heart tracing on a sono.